One of the major advantages of enrolling a child into a local Head Start Program, which provides educational and nutritional support to low-income families with children under the age of six, is early learning that is centered around healthy eating. Programs that feed the children who attend Head Start fresh fruit and promote healthy physical activity programs score higher than programs that serve canned fruits and have limited access to physical activity. A study was recently conducted with regard to obesity prevention at Head Start programs across our nation. The period of time that these programs were surveyed was between February and April of 2008. The data gathered in the study was regarding specific practices that were thought to contribute to healthier attitudes toward nutrition and physical activity in these young participants. Scores were assigned following evaluation for each Head Start program that measured practices relating to physical activity and healthy eating. One of the things that was revealed during this study was that the food supply for Head Start programs makes a difference. As mentioned, the programs that supplied their participants with fresh fruit items were scored higher than those who served canned or pre-packaged fruit items. The same holds true for those who serve fresh vegetables as opposed to canned. Unfortunately, with all of the federal budget cuts that have hit Head Start programs, including sequestration, over the past several months, many administrators are forced to purchase canned or pre-packaged foods to lower food costs for Head Start programs. 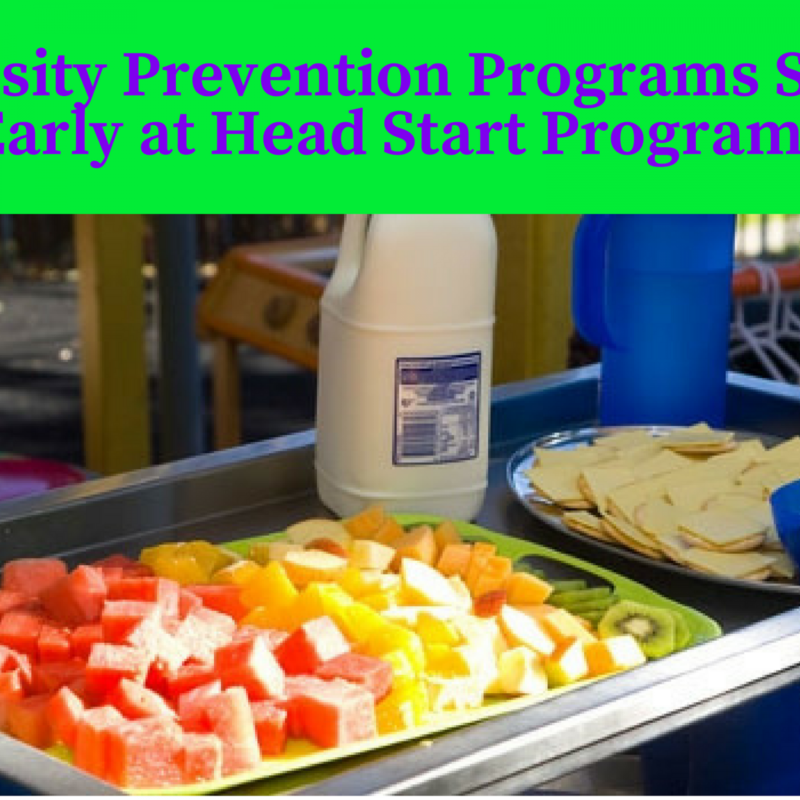 While the study discovered that obesity prevention at Head Start was seen at most of the programs that they surveyed, going beyond basic federal guidelines for health and nutrition in some cases, there was still much work to be done. In fact, the schools that relied on school food service programs, were most notably seen getting lower healthy eating scores. They were also getting lower rates for food cost reimbursement by the federal government. The key to obesity prevention at Head Start and solid nutritional support likes in getting a better food supply for Head Start programs that will make a difference. The purpose of the national study from 2008 was to gain insight into obesity prevention at Head Start programs as a whole, not to be viewed as a performance assessment for individual locations. Once again, while nutritional support was a key element in the study, the authors also examined associated the benefits of early education and support in the areas of healthy eating and physical activity. A total of 15 points were possible for both healthy eating and physical activity as separately rated scores in the study regarding obesity prevention at Head Start. Overall, the average score for Head Start programs in the area of healthy eating was 11.8 and for physical activity, it was 11.2 nationwide. Differences were seen on each end of the spectrum for healthy eating and nutritional support, as well as for physical activity, among various geographical regions in the country. Head Start administrators who are looking to provide the best-possible food supplies and nutritional support to their participants can look to Food Source Plus for the best value in the country. Food Source Plus provides a wide variety of menu and nutritional services, beginning with a free audit of your Head Start program’s food and supply purchasing habits. Once the evaluation is complete, Food Source Plus can work directly with you to implement more practical purchasing procedures and put in place systems that will help make better decisions with regard to food supply for Head Start programs. On average, administrators who work with Food Source Plus are seeing 10-35 percent in annual savings compared to their old methods of food supply purchasing. Food Source Plus uses the NutriSource program, importing each Head Start program’s menus into the database so they can be linked to both the USDA database and the order guides. This helps Food Source Plus to provide each Head Start administrator with the nutritional value for all of the food that they are serving to their participants. The NutriSource program contains thousands of options for participants to use in the creation of menus. Food Source Plus provides participants with a four to six week menu cycle of different types of food that will aid in obesity prevention at Head Start. Foods that are low in salt, ground or pureed – whatever your goals and needs, the recipes for these foods can be divided into multiple portions depending on the size of your program. Recipes can be customized with any special ingredients or instructions as required. In addition to nutritional support, Food Source Plus also provides a complete cost analysis to reveal the cost of every item and every complete meal on the menu to help lower food costs for Head Start programs. This tool is excellent for budgeting purposes when purchasing food supply for Head Start programs. Contact Food Source Plus today to get started with your free evaluation as a means to lowering food costs for Head Start programs. If you are an administrator who is responsible for ordering the food supply for Head Start programs, we can help. Obesity prevention at Head Start is an important goal that we all share, and the nutritional support and cost-effective supply opportunities available through Food Source Plus can help.